ATN NVGONVG730 NVG7-3 Night Vision Goggles FREE SHIPPING! Tough, versatile and combat-ready, the NVG7-3 Night Vision Goggles from ATN are the perfect low-light optic for any police force or special operations team. Combining advanced, third generation night vision technology and precision-optics with a ruggedized construction, the goggles offer the dependable all-environment functionality demanded by tactical operatives. The multi-coated lenses coupled with an internal image intensifier allow the goggles to convert the smallest fraction of visible light into a clear and easy to see image. An impact, weather and fog-resistant exterior keeps all electronic components protected and ready to take on the toughest missions and most extreme environments possible. Optional 3x, 5x and 8x magnification lenses add to the goggles' tactical functionality, allowing them to be easily converted into a powerful long-range nighttime surveillance tool. 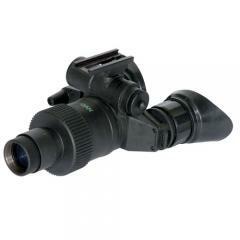 The NVG7-3 can be secured to a comfortable flip-up head mount for convenient hands-free use. ©2002-2019 CopsPlus.com: ATN NVGONVG730 NVG7-3 Night Vision Goggles FREE SHIPPING!